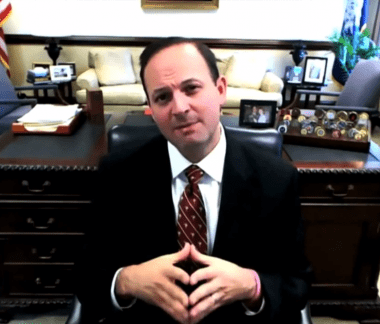 On a recent Thursday, a light rain was washing against the office window of South Carolina’s first-term attorney general, Alan Wilson. On the floor near his desk, about a dozen thick black binders spilled out of the bottom shelf of a bookcase and onto the carpet. Inside each of them: supporting documentation from a 10-month state police investigation into the sitting House speaker, Bobby Harrell, a fellow Republican and arguably the state’s most powerful politician. “And that’s just a preliminary investigation,” said Wilson, gesturing to the pile. The attorney general will not say what’s inside the binders, and no one outside a handful of lawyers, prosecutors, law enforcement agents and grand jurors who are sworn to secrecy have seen what’s in the report. The speaker of the House himself hasn’t seen what’s in it either, although he’s called for Wilson to release the voluminous file to the public, maintaining he’s done nothing wrong and decrying the grand jury probe as political in nature. But the question of what’s in those binders is but one of many queries that have riveted the Palmetto State as it struggles to cope with a scandal unprecedented even by the standards of this often ethically challenged state. Whether Wilson, the state’s top prosecutor, will be able to continue an investigation he turned over to a state grand jury in January has itself now come into question. A state court judge who was elected by the legislators — South Carolina is one of just two states that allow that — issued a stunning ruling last month that said the AG lacks jurisdiction over the powerful speaker. The judge ordered Wilson to shut down his probe. Wilson has appealed to the state Supreme Court, calling the judge’s order “unprecedented in American law and unsupported by any known legal authority,” and has vowed to press on. The state’s highest court has set a June 24 date to hear oral arguments. It might all just be good theater if the situation wasn’t so troubling, and if it didn’t remind folks of a disturbing history here. The merits of this probe — and whatever the speaker might or might not have done to warrant it — have lately taken a backseat to an even broader public debate about whether lawmakers in South Carolina are something of a protected class of citizen outside the reach of traditional law enforcement. Meanwhile, veteran Statehouse watchers are wondering whether any substantial ethics reform legislation — so vigorously pursued by the state’s governor, Nikki Haley — will emerge from a conference committee, now that the legislature has actually adjourned for the year, and make it through the Senate in an extended session that ends this week. The whole sordid stew is raising fundamental concerns about South Carolina’s legislatively dominated government structure, the efficacy of self-policing lawmakers and the integrity of the state’s institutions, such as they are, from the General Assembly to the courts. For exhausted reformers like Lynn Teague, a lobbyist for the League of Women Voters of South Carolina, the stakes are more than a little daunting. “I don’t think there’s anything more crucial for our state government than what happens with this,” she says. South Carolina Gov. 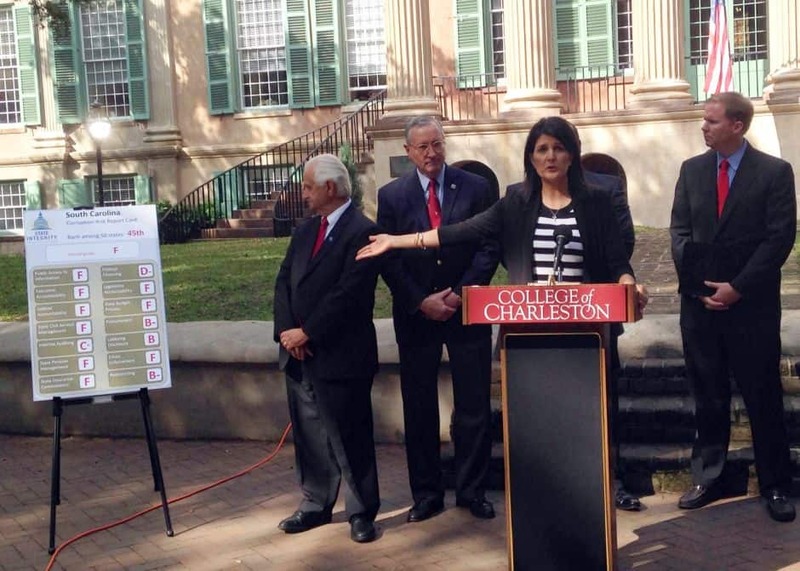 Nikki Haley gestures toward her state’s report card from the State Integrity Investigation as part of an ethics reform tour. In August 2012, when Wilson boarded the state plane with Gov. Haley for a whirlwind tour of the state to promote ethics reform, the attorney general could not have imagined how the situation would look on the ground less than two years later. During the second part of the legislature’s two-year session that ran from January to June of this year, lawmakers had been ripping apart an omnibus ethics reform package like ravished barbecuers at a backwoods pig pickin’; reformers wonder if even a watered-down version which recently came out of a conference committee and heads to the Senate this week might ever make it to the governor’s desk this summer. Meanwhile, Wilson’s own campaign finances are under scrutiny as he fights to keep control of his investigation into the House speaker. Irony, tragedy, farce. It’s all playing out under the Statehouse dome, where a statue of slavery defender John C. Calhoun looms in the lobby and a Confederate flag ruffles in the hot breeze on the grassy grounds outside. Ethics reform has been on the agenda of lawmakers here for more than two years now, ever since South Carolina earned an ‘F’ from the State Integrity Investigation, a project of the Center for Public Integrity, Global Integrity and Public Radio International, which graded the states on their transparency, accountability and risk for corruption. 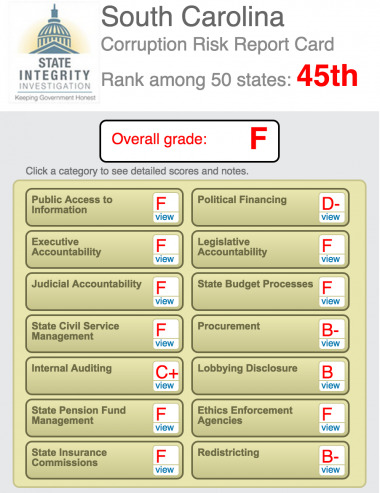 But despite calls for substantive reform from media, public interest groups and even the governor — who set up a blue-ribbon commission and toured the state using the SII report card as a prop — the status quo threatens to fester like a backwater swamp. Those expecting a package of legislation that might actually close loopholes, tighten up ethics rules and fix some of the state’s fundamental problems, such as the way lawmakers police themselves, or what kinds of personal income they’re required to disclose, have seen such attempts unravel in spectacular fashion. Along this twisted road, warning signs appeared early that the whole effort might be little more than a cruel joke. During one memorable day last spring, a mysterious bill that purported to deal with ethics reform popped up in a House committee. Sponsors of the curious measure, including the House speaker, had introduced it as a “shell bill,” which meant there was a summary but no full text about what was in the proposal. Lawmakers eventually made that text public — after they voted on it — and what was in it floored more than a few who had been following the ethics reform debate. The law would have actually decriminalized many ethics violations, including the use of campaign money for personal use. After media stories drew attention to that fact, lawmakers quickly moved to fix the measure. But the backroom political jockeying didn’t stop there. The legislative maneuvering led The State newspaper’s associate editor and columnist Cindi Scoppe to liken South Carolina’s politics to those of Italy — where Silvio Berlusconi’s “minions in the Italian Parliament would pass laws to essentially invalidate the charges” when prosecutors brought them against the powerful prime minister. Mild-mannered Cathy Hazelwood, who has spent 15 years as a lawyer for the State Ethics Commission, says neighbors have been approaching her at church lately, asking what’s so wrong up there at the Capitol. She tells them state government is dysfunctional. As good-government types face the possibility of another year with no substantive movement on the ethics front, they’re also confronted with another matter that underscores deeper fundamental problems in this troubled little state. It comes back to the attorney general’s investigation into the House speaker, and whether he’ll be allowed to continue it. South Carolina House Speaker Bobby Harrell, R-Charleston, speaks to the media during a news conference on the first day of the South Carolina Legislature in January 2014, in Columbia, S.C.
For Bobby Harrell of Charleston, arguably South Carolina’s most powerful politician, Valentine’s Day 2013 was less than romantic. The news leaked first out of the South Carolina Policy Council, a libertarian-leaning think tank housed in a two-story brick house in a leafy neighborhood just blocks from the Statehouse. Wilson, the first-term attorney general, a Republican himself and the son of a sitting congressman, said he’d directed the State Law Enforcement Division, commonly known as SLED, to investigate an ethics complaint alleging potential public corruption against Harrell, the Republican House speaker — a complaint lodged by a private citizen. The revelation hit the state’s tight-knit political circles like a bunker-buster bomb. A wealthy 58-year-old Charlestonian with salt-and-pepper hair and a boyish face, Speaker Harrell runs an insurance agency and pharmaceutical repackaging business. He pilots his own private airplane from a home on the coast to Columbia during the five-month legislative session, during which he holds perhaps the most concentrated amount of power of any state lawmaker in the country. Over the years Harrell has raised hundreds of thousands of dollars and been re-elected without substantial opposition, receiving heavy support from businesses like AT&T and the health care and energy sectors, as well as institutions such as the state Chamber of Commerce. The citizen who filed the complaint? Ashley Landess, the fiery and outspoken president of the Policy Council. She wanted the AG to look into whether the speaker had used his office to get a state permit for his pharmaceutical business, had improperly appointed his brother to a state panel that screens judges and had used hundreds of thousands of dollars in campaign donations for personal expenses such as operating his plane, among other items. Once tied closely to the mainstream Republican elite in South Carolina, the nonprofit Policy Council under Landess, an intense, blonde woman who began captivating tea party audiences since around 2009, became more aligned with the limited-government movement. Along with doing policy analysis for lawmakers, the Policy Council, which does not disclose its donors, crusades for ethics reform and seeks to reduce both secrecy in government and the legislature’s concentrated power. Taking the complaint to the attorney general was an unusual move, and one that’s sparked its fair share of drama ever since. Landess says she shouldn’t have had to do it but was left with little choice. 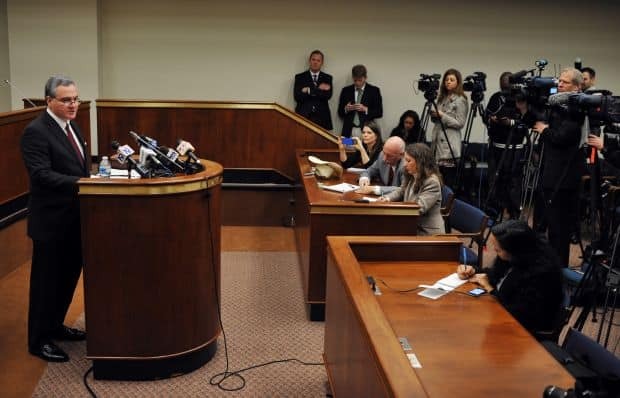 In South Carolina, lawmakers police their own ethical behavior in special legislative House and Senate ethics committees that are made up of their own members. Legislators therefore are outside the jurisdiction of the State Ethics Commission, an independent state agency that regulates statewide officeholders and other public officials. But Landess argued the speaker’s unique power over his colleagues and friends in the House Ethics Committee, and over its staff, had created crippling conflicts of interest. The AG agreed and directed SLED to check out the complaint. In an interview in his office last month, Wilson said he initially expected he might hear back from SLED in a few weeks about the inquiry with reports of poor bookkeeping, or perhaps something minor the House Ethics Committee might be able to take up. Wilson pored over the report with the chief of SLED and about a dozen agents, lawyers and prosecutors. What was in it, says Wilson, convinced the group to unanimously agree to take the next step and impanel a state grand jury, which turned the matter into a criminal probe. Wilson announced the news in January — just one day before Speaker Harrell was to don his blue robe and gavel the House into order on its first day of the legislative session. A stunned and angry speaker said the timing wasn’t a coincidence. For months, Harrell said, SLED agents had been telling him they weren’t concerned with anything they’d found throughout their investigation. Since the inquiries began, Harrell has not been charged with any crime, and has maintained he’s followed the law in regard to his campaign funds and other allegations against him. For their part, his colleagues in the House and Senate have avoided the matter as if it were a toxic poison — as has Gov. Haley. Even the state’s Democratic Party, whose lieutenants have taken any opportunity to criticize Haley during this election year, has stayed out of the Harrell-Wilson fray. But that doesn’t necessarily surprise Landess, who doesn’t believe there’s much ideology left at the Statehouse. The power dynamic among politicians here, she says, is more about who can get what for themselves, and how. All this news comes as Haley has been pushing a narrative calling South Carolina the new “it state,” a place where manufacturers and other businesses should locate; over the past few years, big companies like Michelin, Boeing and Amazon have broken ground here. Charleston, meanwhile, is topping lists as a world travel destination, and the capital city of Columbia’s urban core is undergoing a renaissance. But such a high-profile scandal could threaten to drown out that narrative. Five months after news of the grand jury dropped, the twists and turns in this dramatic political story continue to grip the state. From the Drip coffee house on Main Street near the Statehouse to after-hours downtown political hangouts like Garibaldi Cafe, talk inevitably turns to the most recent bombshell in the titanic clash between two of the state’s most prominent political players. Now at issue: the explosive May 12 ruling by Circuit Court Judge Casey Manning in Columbia that ordered Wilson to drop his investigation. Assisted by two of the best attorneys in the state, both with long backgrounds in prosecuting and defending public corruption cases, Harrell had taken Wilson before a judge, trying to get him removed from the case. Harrell and his lawyers argued that Wilson had called a meeting with a legislative employee of Harrell’s and issued a veiled warning that he wanted a certain bill passed that gave the AG a new unit in state government to investigate public officials. But the judge didn’t rule on that matter, instead raising a much different one on his own. Did Wilson even have jurisdiction to investigate Harrell? The judge asked for briefs from both sides on that question and then ruled against Wilson. “Despite multiple requests, the Attorney General has failed to offer or present to the Court any evidence or allegations which are criminal in nature,” Judge Manning wrote in his order, a line which shocked Wilson, who had said in court that he didn’t want to go into detail about the merits of the case in public because of confidentiality rules. Furthermore, the judge wrote that while Wilson claims the case against the speaker “rises to the level of criminal activity under his jurisdiction,” violations of the Ethics Act are civil and not criminal in nature, a finding with which Wilson vigorously disagrees. Instead, the judge wrote that allegations of ethics violations against the speaker must first be heard in the House Ethics Committee. That’s the panel made up of the speaker’s colleagues, and staffed with people whom the speaker employs. Wilson said those potential conflicts were enough to decide to take on the case himself. Two years ago, the same judge had ruled that a private citizen could not take Gov. 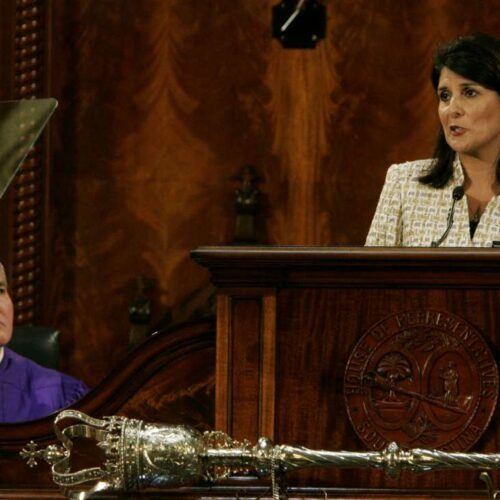 Haley to court for alleged ethics violations that stemmed from her time as a House member. Instead, he’d ruled that a citizen must submit a formal complaint to the House Ethics Committee, which regulates the behavior of current and former members. That committee, then made up of five Republicans and one Democrat, eventually cleared Haley, a Republican herself, of wrongdoing. The public media circus, however, eventually led lawmakers to change the committee’s structure to include five members of each party. But the idea that a judge might one day rule that the legislature is in effect the only place for a lawmaker like the speaker to face scrutiny over potential ethical violations that might or might not be criminal is, well, eliciting a fair amount of discussion. Indeed, during oral arguments before Circuit Judge Manning in court on May 2, South Carolina’s three previous attorneys general, Travis Medlock, Charlie Condon and Henry McMaster, looked on in collective astonishment at the possibility of such a decision. “Over the past thirty years, not one of us ever imagined the Attorney General needed authorization from a legislative committee or political body in order to investigate or prosecute alleged criminal behavior by an elected official,” the three wrote in a statement. To hear Wilson tell it, the judge has basically created a world in which the only route for the speaker of the House in South Carolina to be prosecuted for criminal conduct under the Ethics Act, or public corruption in general, is through a complaint to a committee staffed by folks who work at the pleasure of the speaker. Meanwhile, the House members of that committee rely on the speaker for their appointments to other committees and of course need the speaker’s help to pass legislation that’s important to them and their constituents. Half of the committee’s members have also taken campaign money from an influential political action committee with ties to the speaker. The House speaker’s hometown newspaper, The (Charleston) Post & Courier, which first raised questions in September 2012 about the powerful lawmaker’s use of campaign funds, has been outspoken on its editorial page about the problematic issue of having a self-policing legislature. But Jay Bender, a lawyer who represents the South Carolina Press Association, says Manning’s ruling has some practical benefit. “I think it’s good to decide the jurisdictional issue before anything else happens,” he says. Wilson, who has amended his filings and given back money at the request of the State Ethics Commission, the independent body that regulates him as a statewide officeholder, brushes off his disastrous campaign finances as merely mistakes made by underlings. South Carolina has a long, tortured history when it comes to ethics in government. Many here still remember the shock of a 1990 FBI sting that at the time represented the largest legislative vote-buying scandal in American history. Known as Operation Lost Trust, the sting nailed 17 South Carolina lawmakers for accepting bribes from a well-connected lobbyist whom the feds had flipped and wired up as an informant after they busted him with a kilo of cocaine. The news embarrassed the people of South Carolina, and led lawmakers to pass what became known as the State Ethics Act in 1991. One of those who vividly remember the fallout from those dark days is John Crangle. A few miles from the Statehouse, the retired lawyer runs the state’s chapter of Common Cause and has been spending evenings hammering away at a big metal typewriter in his office at nearby Limestone College, where he teaches political science. He’s working on a book for the 25th anniversary of Lost Trust. 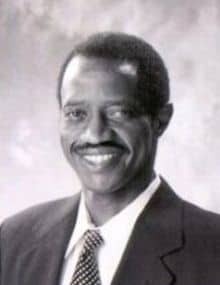 Back then, Crangle was the only lobbyist for the Ethics Act, and he helped write the bill. What he’s watched transpire in recent months, he says, has been captivating. As the director of Common Cause, he’d worked with the Policy Council’s Landess on the complaint against the speaker. For years the groups hadn’t shared much of anything, but lately a crusade for ethics reform at the Statehouse has created a strange bedfellows coalition in South Carolina, bringing together liberal organizations with libertarian ones, good government groups and others more focused on conservation and the environment. For Crangle, the current situation is a symptom of deep-rooted problems in the state’s culture that the political elite haven’t yet addressed. The system, he says, is riddled with conflicts. For instance, South Carolina is the only state other than Virginia with a system by which state lawmakers alone elect state court judges, including members of the Supreme Court. The way Crangle sees it, perhaps never has there been as glaring an instance where conflicts in that system are so apparent. This winter in fact, a rare race for Supreme Court chief justice took place under the dome of the Statehouse, and Speaker Harrell actively campaigned for the incumbent, Jean Toal, lining up votes for her against an associate sitting justice who wanted the top job. Toal eventually won re-election, and as chief it is Toal who will preside over four other colleagues on the bench during the June 24 arguments about whether the attorney general’s investigation into the speaker can continue. He’s sent a letter to Toal and her opponent in this winter’s race, Costa Pleicones, asking that the two recuse themselves from hearing the Harrell arguments because the speaker’s electioneering in their election represented a potential conflict of interest. Meanwhile, as Wilson pushes his probe into the speaker, Crangle says, he wouldn’t have the black eye he’s sporting from his own campaign finance mess if the state had publicly funded elections for attorney general, a proposal Common Cause has long advocated. As Crangle researches his book on Lost Trust, he’s feeling a sense of déjà vu. The state still has an extremely troubled political system and a law enforcement culture that tends to look the other way at potential public corruption, he says. For instance, the Lost Trust sting was not triggered by any legislators or local and state law enforcement, but rather by federal authorities. He sees the genesis of the recent high-stakes investigation into the speaker similarly. Outside groups like Common Cause, the Policy Council think tank and the media had to initiate it. Questions about Harrell’s finances or business dealings hadn’t been raised inside government or law enforcement in the near-decade he’s been speaker or since he was elected to the House in 1993. But even after the arguments take place in what’s likely to be a packed courtroom just a block from the Statehouse, it’s becoming clear that this strange story won’t likely end even there.